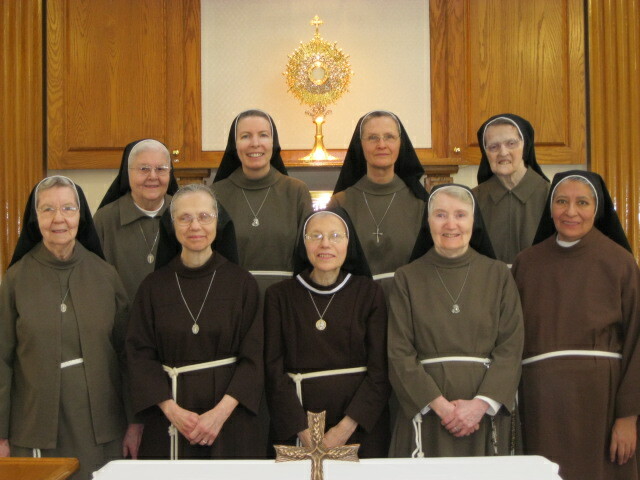 We, the Poor Clares of Andover, MA are entirely dedicated to the contemplative life, professing observance of the Gospel life according to the Rule of St. Clare of Assisisi. St. Clare, our foundress, chose a strict life of solitude (enclosure) in which she was nourished by God alone. Our vowed life centers around the Liturgy of the Eucharist and the Liturgy of the Hours, spaced throughout the day. Eucharistic Exposition is vital to our heritage as Poor Clares. As followers of St. Clare, we are presently a community of 9 sisters with one beloved sister in a nursing home. Our ages range from 48 to 85. We also accept extern sisters who live, pray, and work within the enclosure along with the enclosed sisters, but are more dedicated to the outside needs of the monastery, such as driving sisters to appointments, shopping, etc. Our monastery attracts people making visits during the day and also some come to our Mass each morning. We are located in a suburban area near woods and the Merrimack River. Due to this we are blessed with rabbits, deer, turkeys, foxes and more of God’s fascinating creatures. Our work consists of making vestments, having a guild, portressing, writing lots of thank you letters to our benefactors and friends, gardening, etc. Many call and come to our door with deep concerns for loved ones and for global intentions. The sisters all help with the daily responsibilities that need to be taken care of as in every home. In our dedicated way of life we desire to radically offer ourselves to God and others. This requires a mature, physically and emotionally healthy individual, free of debts and other responsibilities.